1) This paper has been prepared and presented at the FIG Working Week in Stockholm, Sweden 14-19 June 2008. Key words: Education, Curriculum, Young Surveyors, Professional Standards, YS, Continuing Professional Development, FIG WG 1.2. During recent years, FIG has struggled to attract students and young professionals. This has been an ongoing challenge for both the council and corporate members. In order to establish a connection between the young and experienced professionals, meetings were held between young surveyors and FIG members during the recent FIG Congress in Munich, as well as FIG Working Weeks. During these meetings, the need to improve networking and provide the right platform for youth to become involved with FIG became clear. A new Working Group under Commission 1 with the co-operation of Commission 2 was established - The Young Surveyors (YS) WG 1.2, the official representative unit for those individuals who are at the early stages of their career. This paper introduces a model and critical points to establish such Working Groups for non-governmental, national and international professional organizations dedicated to young professionals. Additionally, the paper introduces the Young Surveyors Working Group; their mission, worldwide network, benefits of youth in FIG, recent established activities and long term aims as a model for similar structures. The origin of the surveying profession can be seen in the first recorded history. From the regulations written by the Egyptian Pharaohs and what is left from their works, we can learn how the first known surveyors were valuable to their civilizations. 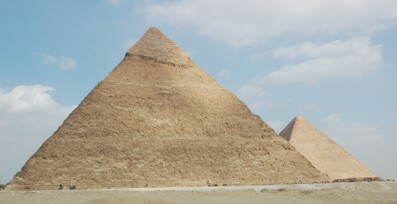 We are still able to see many of the wonders of the ancient and medieval world; such as ancient Giza Pyramids seen in the Figure 1, Acropolis in Greece or Saint Sofia in Turkey. There is no doubt that the very welcomed surveyors played significant roles for erecting such time resistant monuments. As we move through time to the 2000s, when this paper is written, many rapid scientific and technical changes globally have affected the world of surveying. With changes in not only survey technologies, but in computer technologies, we have been gifted tools such as laser scanners, combined total stations with GPS, and satellites that can provide both clear imagery and our position on the earth’s surface. With the changes in technology, pressures and demands on the surveying profession to provide new visions and ideas also came from our societies. Maps, which used to be one of the final products of surveyors for centuries, now turned to steps in much large processes; Geographic Information Systems, virtual 3-D city-models. Today, the profession is facing many difficulties - even describing the exact role of the surveyor in a community. This has also brought forward issues such as providing a sufficient number of highly qualified professionals trained to higher education levels. A noticeable decrease in young people not only undertaking training as surveyors, but joining FIG has made this a global issue. In this paper, some of the major problems of the profession concerning the youth are described. The issue of dedicating time and resources to form a working group dedicated to the future of the tomorrow’s profession are also introduced from the point of the young professionals. The first year of the working group is evaluated with ideas and experiences provided for local application. On the other hand, new higher education possibilities are being established for the candidates of the surveying profession in some developing countries such as Turkey. In recent years, especially after the earthquake hit modern Turkey’s industrialized region, the demand converted surveying in a more popular occupation. Recently, new universities established Geodesy and Photogrammetry departments, thus the overall student quota increased in the country. This also brought about some concerns and serious discussions relating to the quality of the professionals and standards they adhere to. The conditions described show that different countries have different demands, but overall the trend is that surveyors are a dying breed. Hence, the issue of attracting students to surveying and FIG has been initialized and outlined by the FIG Council’s schedule for the term 2006-2010. Taking a global approach, the newest working group of FIG, which is also the youngest one, has been formed to promote the profession to students and establish the necessity bridge for the youth of the surveying professional, aiming to provide a sustainable future of surveying. No organisation or business can survive without some new blood, and surveying is no exception. Younger generations can often provide an enthusiasm and passion for their work that may have been lost in older employees. They bring new ideas and are often willing to uptake new technologies more readily. But it is a symboitic relationship – FIG also plays a role in assisting the youth. They make programs such as international exchanges possible, and also presenting a world stage where individual problems and issues can be overcome with literally a world of knowledge. The diminishing number of surveyors is not a localised or national problem, it is a global problem. Some of the problem may be due to a loss of identity, but the definition of a surveyor is being rewritten by the youth. They are embracing new technologies as quickly as they are released, and can provide innovative solutions to old problems. No longer is a surveyor just one who reads angles, but they are now able to provide a variety of services using a huge array of spatial technologies. The downside of young people being in a profession where the demand is far outstriping the capability to provide is that younger people may develop an attitude and approach to gaining employment that doesn’t sit well with employers. They can very direct on what the future holds and also what kind of financial return they will receive for their efforts, and this is sometimes interpreted by employers as arrogance and disrespect. Potential employers can often, and quite rightly, find younger people lacking in corporate behaviour which is not conjucive to an outstanding employee. Both parties may simply need to accept the positives the other party can bring, while trying to improve their conception of the other. These problems can be overcome by opening lines of communication where neither party is forced to judge or be judged by the other, and both can come to understand each other, and appreciate the skills and knowledge that they possess. One of the roles of the Young Surveyors group is to open these lines of communication, which will ultimately benefit both the individual and the surveying profession as a whole. Under this borderless idea, it was inevitable that FIG would have to establish a student and young professionals group made up of a globally diverse mix if it were to remain in contact with younger generations and secure it’s own future as well as that of the surveying profession. Discussions starting in the early 2000s amongst members of FIG stemed the idea of a special group dedicated to this very role, finally coming to fruition in 2006. Furthermore, many student organisations, including the International Geodetic Students Organization, ISPRS Student Consortium, regional student organizations such as ARGEOS (German Spoken Countries Geodetic Students Union), Spatial Students Working Action Group (Australia) and university student clubs have shown marked improvements on the importance placed on youth participation and involvement. Some baselines have been established, including in Turkey with the Young Surveyors’ Days, which are a 3 day activity for surveyors of all ages to get together. One of the first significant steps of attracting students into the FIG Society was a small meeting which was held during the working week in Egypt the year of 2005. With the motto “Shape the Change” the FIG XXIII. Congress in Munich 2006, support for students was shown with special student registration fees and a meeting session dedicated solely to international students. During this session, international experiences and ideas were discussed and the demands of the Young Surveyors were loudly expressed. After the FIG Congress in Munich, the Students and Young Professionals working group was established with the support and encourage of FIG Council and its members. The first board of the Young Surveyors was established, comprised of experienced individuals from all over the globe. Each member had their own unique knowledge gained from local, regional and global experiences. 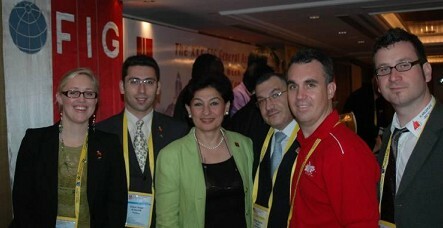 The FIG Working Week in Hong Kong in 2007 introduced the Students and Young Professionals group, and set out their aims and goals. Within the official program of the Working Week, a session for young surveyors was held by the FIG board and the members of the recently established Working Group-1.2 of Commission 1 and as a Joint Working Group with Commission 2. During the session, the need and the vision required to integrate the youth of the profession to FIG were presented, as well as the mission of the working group and examples of how they planned to move forward. The oral presentation titled “Experiences from Student Networks” by Cemal Özgür Kıvılcım was also found valuable, and was awarded by FIG Com.8 members under the theme “the issues concerning the future”. The original name: ”Students and young professionals” was also changed to “Young Surveyors”, derived from Turkish Young Surveyors’ Days. This name was more encompassing, presented a united front for students and young professionals, and also paid respect to the FIG name. Over the course of the working week, the new members of the group met several times in order to shape the structure of the Working Group, as well as to discover more about each other’s experiences. It was determined that the group should belong to the young graduates, academics, professionals, undergraduate and graduate students who would lead the future of surveying. The establishing members of the Young Surveyors group were from Sweden (Chair), Germany, Turkey, Poland and Australia. In the following months, the group organized its next meeting – to be held in Cairo in November 2007. This meeting was themed “The contribution of the young Surveyors to the Society”, and was supported by FIG Vice President Dr Dalal Alnaggar and Commission 1 chair Yaacoub Saade, as well as FIG council and commissions and corporate members. This meeting was very successful, with members from Sweden, Germany, Turkey, Australia and Egypt attending. During the meeting, the Young Surveyors group drafted their Master Plan, which outlined their visions and goals for the next 2 years. Vision: “To make FIG known to Young Surveyors and increase the participation of young surveyors in FIG events” (FIG YS Workplan). This vision is vital for not only for the immediate future of FIG, but also to ensure that a professional body exists for future generations of surveyors. Purpose: FIG has a long history of providing world class service to it’s global network of members, and the role of the Young Surveyor in it’s future is vital. The Young Surveyors group is a mechanism not only to promote FIG to young surveyors around the world, but also to ensure that their voice is heard. It also provides a critical link in the continuum of knowledge – FIG can provide a platform where young and old can exchange ideas and knowledge, ultimately to the benefit of the surveying profession. Figure 3. The role of the Young Surveyor is a critical link in the professional chain. Promote the benefits of participating in FIG events to young surveyors for professional development. Attract young surveyors with simple activities that allow delegates to specifically build useful networks. Provide opportunities for delegates to obtain advices on getting funding and sponsorship (external to FIG) that will allow them to participate in FIG events in particular, congresses and working weeks. Promote and encourage the production and presentation of technical papers by Young Surveyors at FIG events. Roles and Responsibilities: A number of roles were identified as being critical to run the Young Surveyors. The roles were modelled off the existing FIG council, commissions and working groups. The positions, their responsibilities and current holders are outlined below. The head of the Young Surveyors. Is responsible for contact and communication with FIG officials, and to report back to the group. The chair is also responsible for the distribution of information, chairing meetings and delegating jobs to other members of the Young Surveyors. Major role is to support the Chair and fill in for the Chair in their absence. The Vice-Chair is also responsible for collecting and collating information about the workings of each commission and passing it on to other group members. Is responsible for the publication of the quarterly newsletter of the group as well as providing and preparing information for publications and presentations to be made by the group. Is also the contact person for new members, and the newsletter and communications database. Responsible for organizing the events at FIG working weeks, congresses and functions. As responsible for making contact with the local young surveyors group or organisation and facilitating their contribution to the FIG event. Responsible for organising sponsorship of the Young Surveyors group such that it can have regular meetings and provide adequate services to Young Surveyors worldwide. Is also responsible for the monitoring of monies in and out of the group. Responsible for the provision of marketing materials, products, events and direct communication to increase the profile of not only the Young Surveyors, but FIG. The marketing role is also responsible for establishing key programs, such as the Mentor program. These are those who are not on the executive, but participate in the workings of the Young Surveyors, and are vital to the success of the group. While the first official meeting of the WG can be accepted as the meeting at the Hong Kong Working week, the meeting in Cairo in 2007was the first chance for the group to meet and establish a path for it’s future activities. In this technology based world, the first move was to establish and official Young Surveyors FIG website (http://www.fig.net/commission1/wgroups/wg2_06_10.htm). The website allows for a central point of information distribution and communication – including events, newsletters, papers, photos and reports. Communications were identified as a key issue - two distinctly separate streams of communications needed to be established, one for the committee members, and one for general group members and other interest parties. Group executive members now communicate primarily through a Yahoo! Group, and have Skype meetings fortnightly. Communication to other group members and other parties is also done through a separate Yahoo! Group, and the Young Surveyors official FIG website. Other communication avenues, such as podcasts and RSS streams are also being explored. Another step was creating a unique, recognisable logo for the group. It was decided that it should honour the FIG logo by maintaining the colours and general layout, but put a Young Surveyors spin on it. 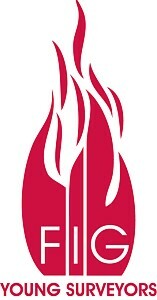 The result was the FIG Young Surveyors flame, seen below in Figure 4. One of the most noticeable, and possibly the largest communication tool is the Young Surveyors newsletter. As a policy this newsletter includes the workings and activities, photos and profiles of the group, and is published quarterly per year. So far two issues of Young Surveyors has been published and a special issue is in publication:. One other key project that will come to fruition in Stockholm Working Week 2008 is the speed mentoring program. Similar to speed dating, young surveyors have a few minutes to talk to older surveyors (referred to as ‘wise ones’) about anything career or profession related before rotating to the next ‘wise one’. This has been a successful event several times when run in Australia, and hopefully Stockholm will provide similar positive outcomes. As with any volunteer group, there are difficulties finding people, time and money to undertake the work of the group. The Young Surveyors group is no different, but have the addition obstacle of its members being scattered all over the globe. This problem has been overcome through the use of Skype, the internet phone service. Members of the group meet for a teleconference style meeting once a fortnight, and while the meeting is often late a night for those in Europe, it is counter balanced by being early in the morning for those on the other side of the world. Fortuitously for the Young Surveyors group, its members all have a passion for their profession, and are quite active in their own countries and regions. While the addition of membership on the Young Surveyors may be seen as an addition burden to already busy people, the members of the committee see their role as a chance to further their profession and personal careers, while providing an essential service to other Young Surveyors. The introduction of a Young Surveyors group was initially view with scepticism by some members of FIG, but thanks largely to FIG council support and positive action of the group, it has prospered and is growing every day. The hosting of events at working weeks at congress, securing student registrations, and providing electronic communication on a regular basis will further serve to get rid of any last remaining scepticism on the groups viability. 8. OUTLINE OF FUTURE – WHERE TO FROM HERE? The working group is the bridge between the past and future of the profession– it allows and promotes the Continuum of knowledge of FIG to be passed from generation to generation. The young surveyors group will continue to actively facilitate, communicate and market FIG to the younger generations, while also providing the opportunities for young surveyors to become actively involved in the workings of FIG. For this to occur, the Young surveyors will need to be active at on local, regional, national and global stages. This will be achieved through maintaining a global group that will communicate regularly and provide a world of knowledge and resources to those who need them. Meetings such as those held in Hong Kong and Cairo will continue; Stockholm in 2008, Sydney in 2010 and plans for WG meeting in Turkey in 2009. These events will continue to allow the evolution of the group, while building a fantastic knowledge base from people all around the world. Promoting the needs and interest of FIG younger members, through student registration to events, specific student sessions and encourage student paper submissions will also allow the goals of the Young Surveyors to be achieved. Like other working groups and commissions, the success of the Young Surveyors lies with its members. To date, members have been passionate, enthusiastic and driven to contribute to the vision, purpose and goals of the group, and there is no reason to believe that this won’t continue. With the ongoing support of the FIG council, members and corporate sponsors, the Young Surveyors group should flourish in the future. The FIG WG 1.2, known as the Young Surveyors, is a step towards understanding and taking part in a changing world. The new era of technology, science and information will rise in the hands of today’s students and young professionals. This technology, combined with our professional skills will benefit not only the built and urban environments, but mankind as a whole. The new roles of the surveying in society need to be clearly defined for the profession to market itself, and to avoid extinction, but this can only be achieved with the help of all members of surveying and by combining the experiences of the “old” and passion of the “young” surveyors. The contribution of both individuals and regional and local societies from all around the world is a necessity to ensure a healthy future for FIG. The FIG Young Surveyors group belongs to neither a group nor a country and therefore is open to all, no matter where they are from. It is the peak of representation of the youth in surveying. All are welcome to join, and are encouraged to help in the development and progression of the group. This progress at a global level will allow the FIG Young Surveyors to assist in growing healthy and sustainable local, regional and national Young Surveyors group, hence ensuring the future of surveying globally. The Young Surveyors working group would like to thank FIG and all its members for believing in them and for helping them to create the future. LINDEN C., KIVILCIM C.O., (2007) The report from Hong Kong WW, FIG YS Newsletter 1st issue. MAHONEY R., PLIMMER F., HANNAH J., KAVANAGH J., (2007)Where are we Heading? The Crisis in Surveying Education and a Changing Profession. Paper presented to FIG Working Week 2007 Hong Kong SAR, China. Cemal Özgür Kıvılcım, is a MSc Student at Istanbul Technical University Geomatics Program. He is currently an engineer Geodesy and Photogrammetry Engineer at Istanbul Metropolitan Municipality, Directorate of Historical Sites Protection. During the recent years he participated and was member of organizing committees of student related national and international organizations for Surveyors. He is a participant in recent IGSO, ARGEOS, Young Surveyors’ Days meetings, He is one of the founder members of ISPRS Student Consortium, IAESTE-Turkey Student Association, FIG Young Surveyors and worked as an Erasmus student assistant during his studies. He is an active member of FIG Young Surveyors, ISPRS Student Consortium and Turkish Chamber of Surveyors and Cadastre Engineers. Chris McAlister completed her Bachelor and Master of Engineering at University of New South Wales in 2005. She is currently a surveyor at the Environmental Protection Agency and Queensland Parks and Wildlife, Queensland, Australia. Chris was president of the student society at UNSW during her final year, and has continued to remain involved through the Spatial Students Working Action Group. She is the university coordinator on the Young Professional’s committee of the Spatial Sciences Institute Queensland, and is a Young Ambassador for FIG2010.